A member of the U.S. military? You can make a difference in the lives of children by selecting National PTA as your charity in the Combined Federal Campaign (CFC). National PTA is a proud participant in the Combined Federal Campaign (CFC), the federal government’s workplace giving campaign. Through payroll deduction, federal employees can donate to their charity of choice. The Combined Federal Campaign (CFC) is the world's largest and most successful annual workplace charitable giving campaign. For more than 100 years, National PTA has been an advocate for children in education, health, and safety. National PTA provides all American children the structure, support, and resources they need to thrive in the school community, whether at home or stationed with their military families abroad. 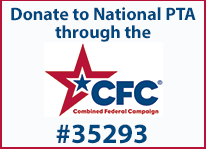 If you are a federal employee, postal worker, military member, or federal contractor, please consider designating National PTA as your charity of choice for the 2017 Combined Federal Campaign (CFC) #35293. Or search “National PTA” in the catalog. Click the "Share" button to raise awareness of this campaign. Thank you for your support through the CFC.